Photographers spend thousands of dollars on a high-quality camera and lens but often find their images aren’t as sharp as expected. The Focus Pyramid unlocks the cameras true potential, maximizing performance by fine-tuning the autofocusing system to create sharper photographs. From manufacture to manufacture and even lens copy to lens copy, there are slight variances as to the exact point where light is focused onto the sensor. 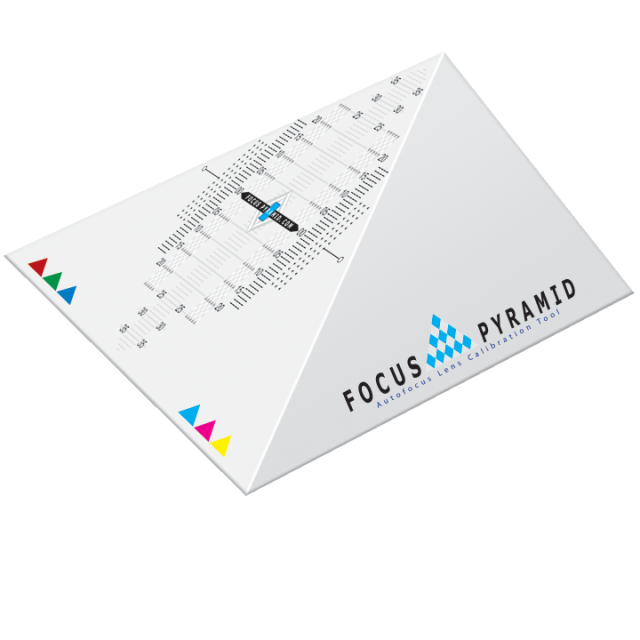 The Focus Pyramid is a true form meets function undertaking designed to help identify these variances allowing you to fine-tune your autofocusing system. With the ultra-high resolution that today’s cameras can capture, manufacturers have recognized the need for such calibration. Many manufacturers have equipped their DSLR’s with the ability to save custom autofocus settings right into the camera body. 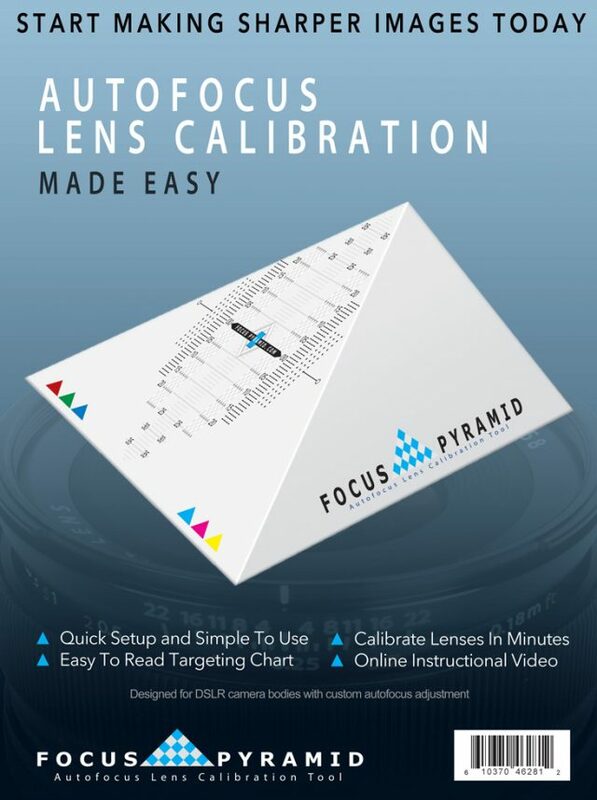 Unlike the Focus Pyramid, other autofocus lens calibration tools remain on the shelf after purchase due to being difficult and time-consuming to set up and use. 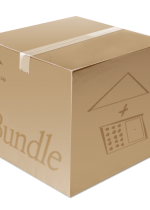 Focus Pyramid’s direct targeting system and ease of use produce stellar results at a fraction of the time and cost. When a photographer requires tack sharp images and time is of the essence the Focus Pyramid is there. Bare-in-mind this list is NOT all inclusive as all major camera manufacturers now understand the importance of lens calibration and have noticed savvy camera buyers demanding custom autofocus calibration capabilities included in their cameras. Please check your camera manual for AutoFocus Lens Calibration or Fine-Tuning. * Most modern DSLR camera bodies allow for AF Fine Tuning / AF Adjustment. Contact your camera manufacturer if you’re uncertain your camera will allow for autofocus calibration and micro adjustment. In the convenience of your home or studio, the Focus Pyramid will help you achieve the sharpest photographs possible. • Does your compact point and shoot camera take sharper images than your $2000+ DSLR at times? 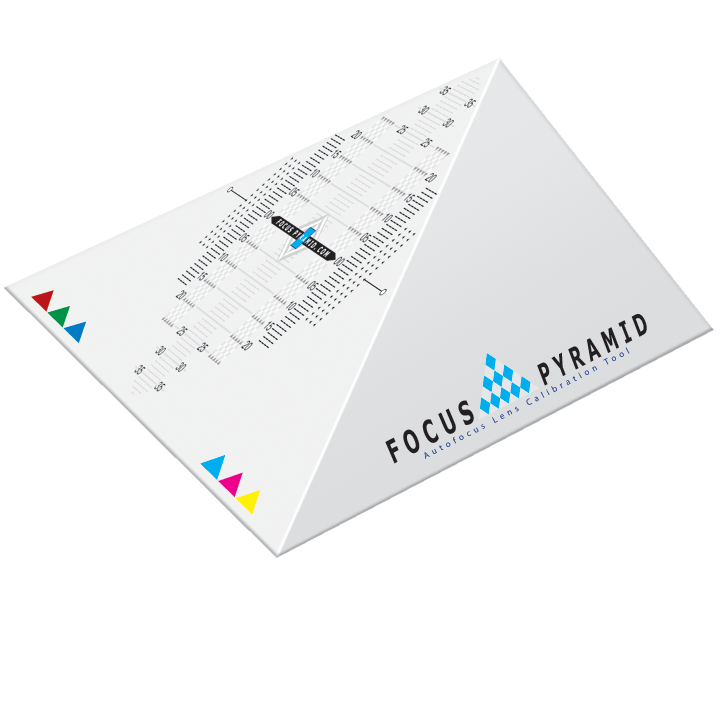 For these and countless other reasons we developed the Focus Pyramid; a compact, low cost, and easy-to-use autofocus lens calibrator. Using the Focus Pyramid in conjunction with one of the many modern cameras, you’ll have the option of making a global adjustment or lens specific micro focus adjustments. Remember, with the latter, each and every time you snap on a new lens your camera body will automatically dial in the correction required to assure precise auto-focus every time! I finally had a chance to calibrate. My 40mm pancake and 85 f/1.8 were fine, but my 50mm f/1.4 needed help! The pyramid is a great tool and helped me to finally nail the focus on my lenses. Thanks for a wonderful product. Received Focus Tool and used it to match my new Nikon D800 with a 50mm F1.4g lens. High-quality print and pyramid angle helped identify focus shift between f1.4 and f2.8 thus able to tune lens to a sweet spot for the main aperture I use. Many thanks, Worth every penny. 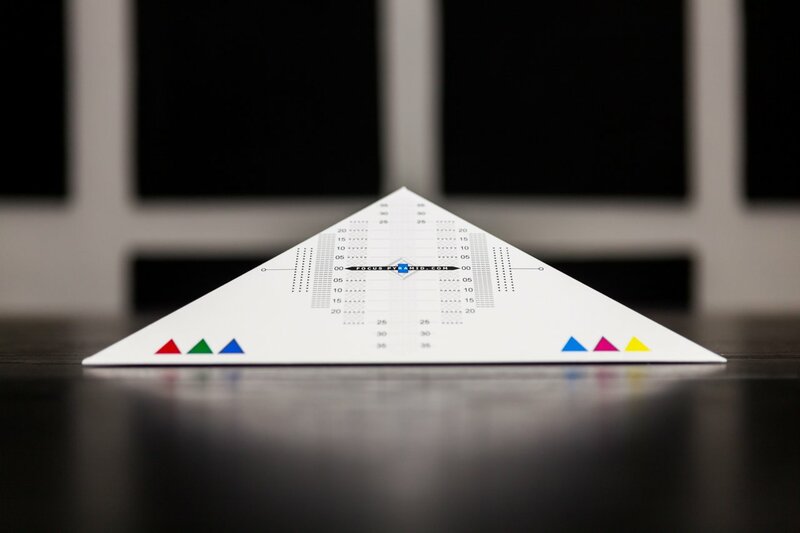 The focus pyramid has become an essential part of my photography toolkit. It is fast, accurate and critical to getting tack sharp pictures. I was able to micro-adjust 6 lenses over lunch with this wonderful tool. Being portable, I’ll be taking the focus pyramid with me to make sure that my lenses are correctly adjusted no matter where I shoot. The focus pyramid is easy to set up, the online instructions are clear, simple to understand and a great way to get the most out of your camera and lenses. It’s a bargain at twice the price. I set up the pyramid in my living room, connected my camera to my laptop and used tethered shooting in Lightroom. Zooming into 3x I was able to easily see where my lenses were autofocusing. Setting the micro-adjustment level on my Canon 5DII, I was able to quickly dial in the right focus point. Make sure you have plenty of light on the pyramid and, as the online video shows, position your camera level and at the right distance and start shooting. You will easily see where your particular camera and lens pair are autofocusing. My pictures are noticeably sharper after just a couple of minutes. Compared to some of the competing products, the focus pyramid is much easier to set up, use and still have the level of accuracy we all desire. Thanks! The focus pyramid arrived today, and after a long editing session, I put my cameras and lenses on the tripod and shot away. AF Fine tuning the D700 was easy in Lightroom 4, but it does not yet support tethered capture for my new D800, so I did the fine tuning the long way instead. The results made interesting reading. I have 4 lenses: the 50 F1.4G, 24-70 F2.8, 105 F2.8VR, and 70-200 F2.8 VR II. The 24-70 has just recently returned from Nikon after a service, and it turned in the best performance on both cameras – No adjustment needed on the D700, and -3 on the D800. The 105 F2.8 VR: Not bad.. -2 on the D700, but -14 on the D800. 70-200 F2.8 VR II: +4 on the D700, -12 on my D800. The 50 F1.4G: -8 on the D700, and I went to -20 on the D800.I am looking forward to a better performance from my D800 in future, especially with all those megapixels. I never dreamt in my wildest dreams that my lenses/ cameras were anything other than perfect- I always put down out of focus images to my own poor technique. 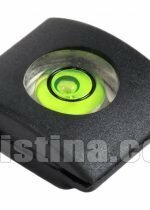 Don’t forget to pick up a Hotshoe Spirit Bubble Level during checkout or head over now.